i have an APU4c4 with an empty mSATA SSD installed. I intend wo install OpenWRT on the SSD. However, I don't get that far. The RAM test runs fine, temperature after some hours is 60 Celsius. I prepared several x86 (64bit) Linux Live USB sticks (eg GParted Live, Debian Live, Rescue Live, OpenWRT, to boot from and to download the OpenWRT image to dd it onto the SSD. 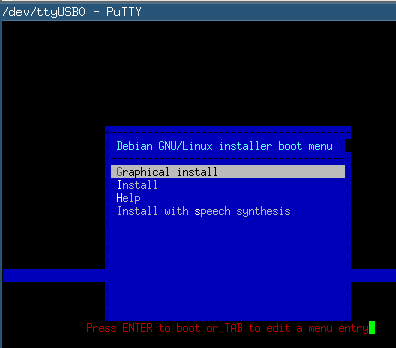 The bootloader will load the boot menu of the Live USB sticks and display it. Nothing visible happening from that point on. The only image that I tred that would boot properly from USB is OpenWRT 18.06.02. Unfortunately opkg doesn't offer GPartEd out of the box, so I need some other Linux distribution to extend my file system on the ssd. So I am back to square zero, see above. your serial console goes blank because the kernel which you are booting does not know that you want it to display on the serial console. Thanks Eike, thats more tricky than I expected it to be. How would I tell the bootloader to use the serial port as console? As I figure from the article you provided that I need to specify "console=ttyS0,115200" somewhere during the boot process, right? I'm sorry, I only ever installed OpenBSD on APU1 and APU2 boards and Alix 2D13. Press H, enter the following parameters and press Enter. With other Linux distrubutions I do not have experience on PC-Engines boards. You will certainly find more hints; Google or Startpage for that matter are your friends in this case.